i love the holidays. i love the horsleys. press play. Lindsay Ross - Happy Birthday-Anniversary! Your photos radiate love, beauty (and confetti:) I am continually inspired by your work and would love to end up on the other side of your lens one day. My husband and I have three young kids that are the joy of our lives. We are in a transitional time as we are about to move cities for a change of pace and more space for our kids to spread their wings. It’s a crazy time, but I think anytime is a great time to stop, drop and photo shoot. Billie Lang - It’s been a long time since we’ve had a family photo, my son was 9 months old. He’ll be 9 this year and he has a little sister now who just turned 3. We can be silly and goofy at times but most of all we love to love each other. Aimee - Happy anniversary (wedding and photography), happy birthday, and happy mothers day to you! Amber Grmek - We are a small family of three, but it’s just perfect for our family. Our son turns three tomorrow (you guys ALMOST share a birthday). Being a mom means I’m usually on the back side of the camera and not the front and would love for you to document our family. AMBER GRMEK - Being a mom means I’m usually behind the camera and not in front a whole lot. We are a family of three, but it’s just perfect for our family. Our almost three year old (his birthday is tomorrow, you two almost share a birthday) says “it’s just the three of us in a circle, daddy mommy and Nicolas”. Would love to have you document our family! Nicole O - I would love to have photos of my family on our river jet boat banked on a sand bar in the middle of the river. Nicole - Happy birthday/anniversary Andrea! I would love for you to photograph my family again. You photographed our Benjamin a few months after he was born and captured our sweet boy in the most perfect way. Those photographs are some of my most prized possessions. It was a joyous, but difficult time when they were taken as we were unaware of his Down Syndrome diagnosis before he was born and working through the roller coaster of emotions that came with it. But like I said you captured a beautiful, perfect baby boy. lindz - May is such an awesome month for you and your family!!!! Katie Rauckman - My amazing friend Kelsy told me about your contest, and I know you’ve captured many favorite family moments for her…how could I not put my name in for this!? Lis - I have to say, your photos are just awesome. Laurie - We are expecting our second child this fall after years of trying… We have an amazing surrogate carrying our baby! I can’t wait to hold our little babe in my arms and have our first set of family photos taken together!! Joanna Dawyd - May is my birthday month too! And my favourite because it is usually when we transition from snow to flowers. Our family has never had professional photos taken, and I’d really Iike to capture this time, right now, just as our kids move from being little kids to being big kids. I’d love to capture the sense of fun my husband and kids have, and somehow combine it with my sense of peace. Can it be done? I do not know! rebbi anderson - hi andrea and happy belated birthday! Jen Dubois - Happy Birthday! Candis Johnson - My daughter, Olivia, has taught me the meaning unconditional love and patience. I look forward to waking up every morning to see her. Jessica Small - You have such lovely work! We would like to capture our new little family as we are right now. We have a beautiful busy 8 month old little girl and never could afford maternity or newborn photos. We always wanted to do a family session with just the 3 of us. 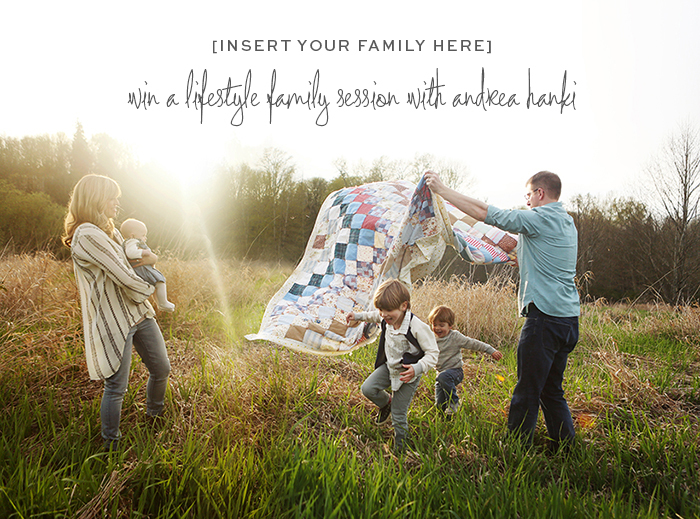 Nikki - I would love to win this family photo session with you ❤️ My little “new” family has never had our photos taken before. We are a new blended family, I have 3 amazing little boys and an amazing man in my life and I would love to have a family session with them. Bethany Vreugdenhil - Happy birthday! Asha - I’d be so thankful to have you photograph our maternity shoot. I’ve loved your art since the first time I saw it at the Spring Fling for the park. Brandy - We’re a bi-cultural family of five; 50% Italian, 50% American and 100% awesome…heh hem… You’d like us. And we know we’d like you. Kaite - First off, happy birthday! carla - me!!! i want to be in the photographs with my precious family!